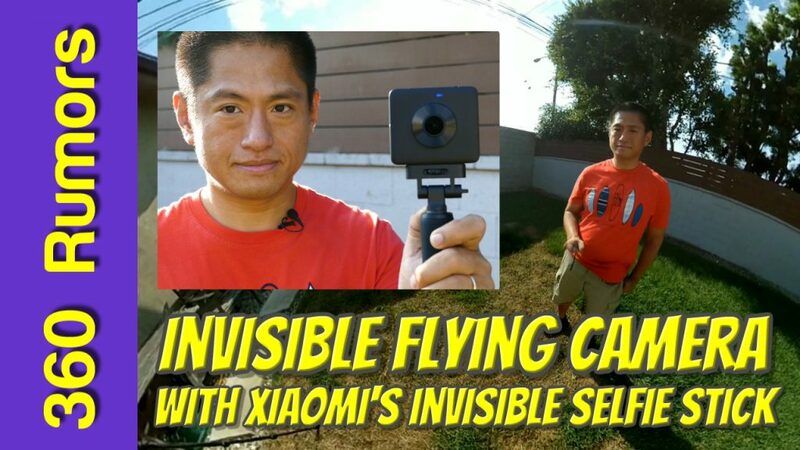 Here is a review of the new dedicated selfie stick for the Xiaomi Mijia Mi Sphere, and a quick tutorial on how to do the invisible flying camera effect. To do the invisible flying camera effect, you need a 360 camera and a selfie stick that is narrow enough to fit between the lenses of the 360 camera, such as the dedicated selfie stick. If possible, the 360 camera should be stabilized (but even a non-stabilized 360 camera can work if you are only moving it horizontally). As of September 7, 2017, the 360 cameras that have stabilization include the Xiaomi Mi Sphere, the Insta360 ONE, the Garmin Virb 360. The Insta360 Air and Insta360 Nano also have stabilization but must be attached to a phone. 1. Attach the 360 camera in-line to the selfie stick. 2. Hold the selfie stick with your hand at a fixed, natural-looking position. 3. Start the recording and pan the camera using only your wrist movement. Note: for Xiaomi Mi Sphere, you must wait at least 5 seconds after powering on before you record, and you must also ensure the camera is upright when you start the recording. If you want a 360 video, that’s all you need to do. But if you want to convert the 360 video into a 16:9 non-360 video, you need to use Insta360 Studio, a free software. As you can see in the video, the dedicated selfie stick is totally invisible to the camera (as long as the camera is positioned in-line with the selfie stick). It’s true that there are other selfie sticks that are invisible but the other key feature is that the Mi Sphere’s selfie stick can control the camera without needing any batteries. Rather than using a Bluetooth connection, it uses the electrical contacts at the base of the Mi Sphere (I believe pressing the button on the selfie stick merely completes the circuit). It’s a clever feature and it’s very convenient that I don’t have to connect via Bluetooth before using the selfie stick. And I can’t tell you how many times I’ve brought a Bluetooth remote only to find out that the battery is drained. With this selfie stick, you won’t have to worry about that at all! The Mi Sphere does have a Bluetooth capability, which is still unused (it won’t work with generic bluetooth remotes, nor does it work with the remote for the Xiaomi action camera) so I am supposing there will be a Bluetooth remote accessory in the future. To summarize, yes I would highly recommend this selfie stick for its convenience. Incidentally, the Mi Sphere camera is on sale for $206.99! (Limit: 2 per person; only 50 units at this price). If that’s used up, here are other discounts! The selfie stick is now available from GearBest for around $22 — use the code GB10% to get 10% discount! Thanks to the Mi Sphere Facebook group and thanks to Jason Wang and his amazing team! Hi Mic, the 10% discount code for the selfie stick doesn’t seem to work anymore on BG. Walkabout Worlds uses a consumer 360 camera to create a true 360 VR video with 6 degrees of freedom!